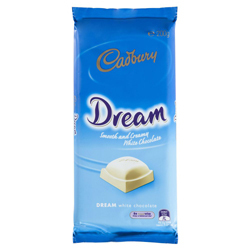 Creamy, delicious, smooth, melt in your mouth, real white chocolate which contains cocoa butter. Sugar, Milk Solids, Cocoa Butter, Emulsifiers (Soy Lecithin, E476), Flavours. Can't believe how fast the delivery was and how big the chocolate blocks actually are! Delivery fees were so cheap and to be able to get Dream chocolate for such a cheap price and delivery that good is amazing! I used to have these as a treat when I was younger, being the best white chocolate id ever had I was gutted to find it gone from the UK. It tastes just as it did, and the shipping is so quick! Let me just start by saying Wow thou can't get a better chocolate than this and today a is the first time I've had it in 8 years as I live in the uk and we don't get it here. This brings back so many memories so thank you so much Sansa deliebery was excellent and easy so thank you and if you haven't had this your missing out. The best chocolate i have ever eaten. And although its no longer in the UK i can still buy it at affordable prices! A classic chocolate bar, great taste.